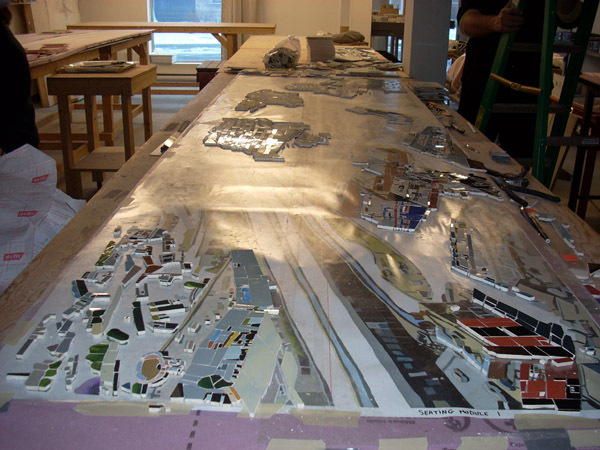 This is the third in a series of Source posts providing a behind-the-scenes look at the artwork fabrication process for each of the seven new Metro Rail stations under construction along the second phase of the Expo Line between Culver City and downtown Santa Monica. The artworks will create a welcoming environment for future riders and connect the stations to surrounding neighborhoods. 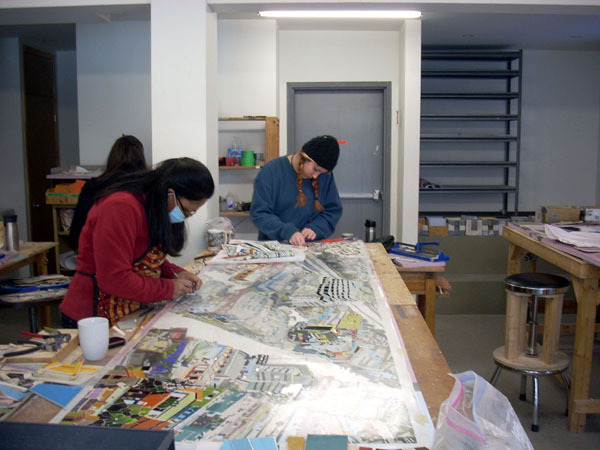 Commissioned artists include Constance Mallinson, Shizu Saldamando, Abel Alejandre, Susan Logoreci, Nzuji de Magalhães, Carmen Argote, and Judithe Hernandez. This post introduces the artwork of artist Susan Logoreci, which will be featured at Expo/Sepulveda Station. Logoreci’s original artwork, Right Above The Right-Of-Way, uses colored pencil drawings to express the area’s urban form and housing. The original drawings were translated into hand-cut ceramic tile pieces that were kiln fired. 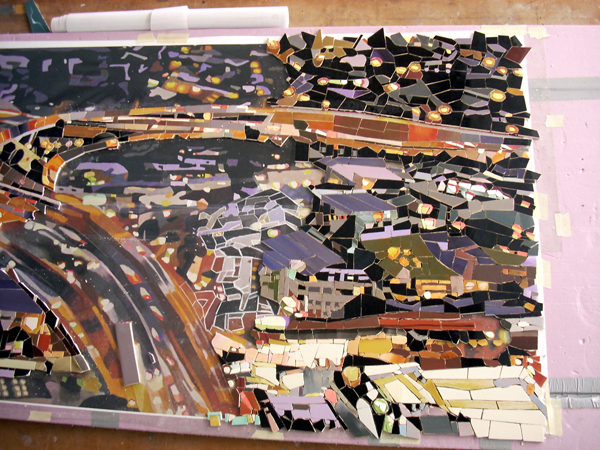 The eight hand-glazed, hand-cut ceramic mosaic panels will be installed in overhead structures at Expo/Sepulveda Station entries and throughout the platform, highly visible to transit customers and the general public. Logoreci is integrally involved in the process to ensure that the ceramic tile artwork matches the color and hue of her original drawings. High resolution scans of Logoreci’s artwork were sent to the artwork fabricator, Mosaika Art & Design, along with scaled match prints. 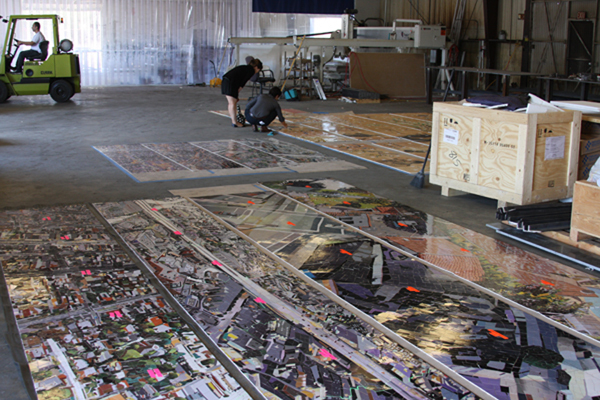 The fabricator printed the electronic files at 100 percent scale to be used as full size layouts and in developing a full custom glaze color palette. After the color palette was reviewed and approved by the artist, Mosaika rolled out their own hand-made clay into large ceramic tiles. Custom colored glazes were then applied by hand onto the tile before firing. Once the tile was fabricated, artisans at Mosaika hand cut the tile into varied shapes and sizes to match the full size prints. Fired ceramic tile is a highly durable material often used in transit environments. 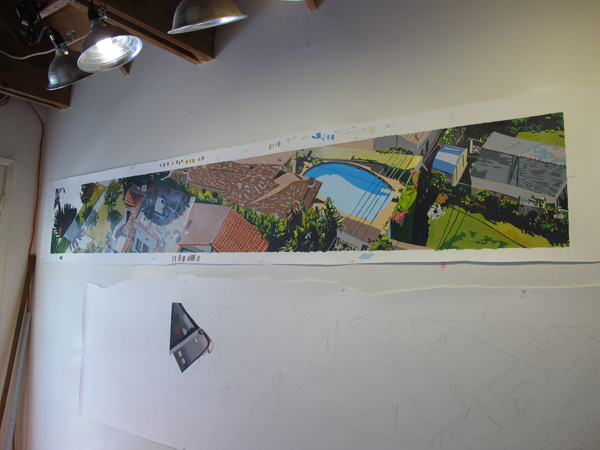 Artwork Description: Right Above The Right-Of-Way depicts aerial views of local neighborhoods in an intricate series of colored pencil drawings and captures the sensation of standing on the aerial Expo/Sepulveda Station. Drawn from photographs that were taken from a helicopter hovering above the city, the images present the built environment of the area punctuated with identifiable landmarks. 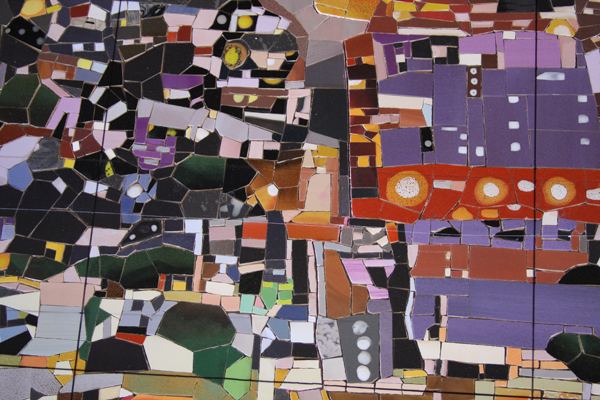 Seen as a body of work, the group of eight artwork panels reveals a patchwork of growth and development that describes an ever changing civic infrastructure. 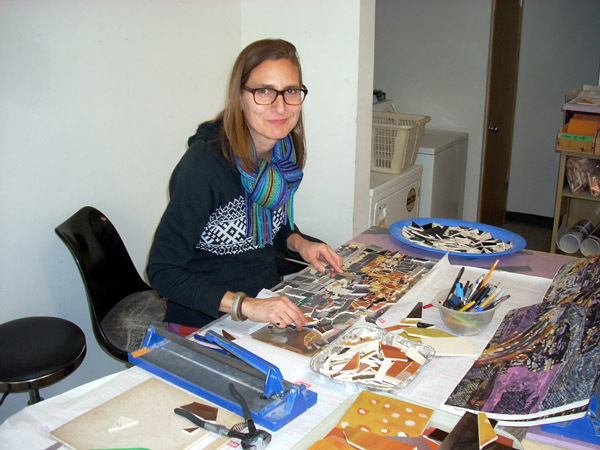 Click here for more information about the artist and here about her work for Expo/Sepulveda Station. Colored pencil drawings at artist’s studio during a studio visit by Metro Art staff. 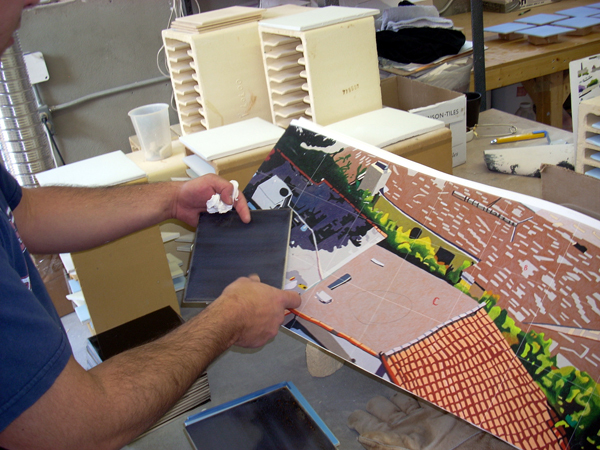 Inspection of artwork panels after delivery by the fabricator to ensure that the colors of the original artwork are accurately reflected in ceramic mosaic and that the color is consistent among all of the panels.